This may not be a JBoss Tools problem at all, may be an m2Eclipse problem, but I figured I would post here since I did see JBoss Tools errors several times. "saying it was unable to read the artifact descriptor"
Got a screenshot/stacktrace for that ? Just wondering "who" does it. Wait, so I guess maybe this is a repository error. I couldn't see this before because there is no stack trace in the Problems pane. You have to bring up the Properties dialog and clip it out. The reason I said crazy was the first time I changed this eclipse literally went into drone mode and lumbered along for around an hour... then spit out these errors.. Rob, yes - the error you show is some problem with mvn repository resolution and it seems to be concerning certificate for repository.jboss.org - I know there have been changes to the certificates on jboss.org recently but that is a month or longer ago so weird you should just have that problem now ? I know it sounds insance, but have you tried restarting eclipse to see the problem continues ? Hey Max: I didn't need this dependency right away so I dropped this for a while. Went back to it. I figured out what's going on here, but not what to do about it. The aws java sdk pulls in a transitive dependency called jackson core. When it tries to pull it in, it goes off into the weeds. When I run maven from the command line it works. It downloads the dependencies and compiles. What I think I figured out is that the problem is that our corporate repo is going through Nexus now. Was all working fine before upgrading to Indigo and White Rabbit. Still looking around.. drag is that the comamnd line compiling doesn't make the project work in eclipse. I just ran into this same SSL error today when trying to resolve artifacts from repository.jboss.org via my own artifact manager. Is there someone you can contact to look into the certificate situation? 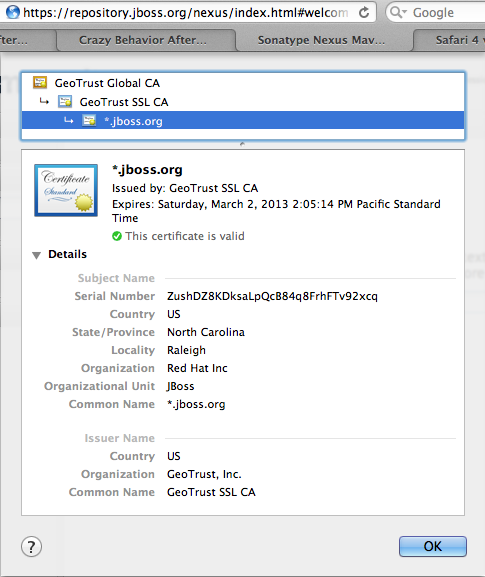 At a glance, the cert does look okay, but yet the problem persists. Thanks for whatever you can do! Your browser is doing it right, but my guess is your artifact manager is not using/reading/caching the proper certiifcate. Maybe clear out its certificates/refresh it or ? Thanks, Max. This was indeed it. 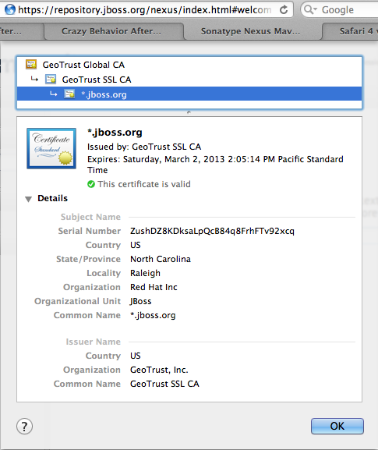 We imported the cert into the trusted keystore on our side and all is well. Thanks for coming back and verify that was indeed the case and others can benefit from this thread in the future.